HAND-FORGING And Wrought-Iron Ornamental Work By Thomas F. Googerty, 1911. 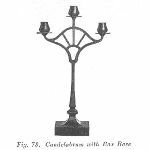 Figure 2 The base and stem of these candelabrum are made from one piece of steel. Optionaly the box base may be screwed welded or brazed onto the stem. 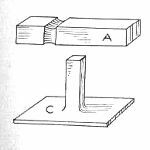 In both cases the box base is forged the same way. When finished they can be chased or decorated using various methods. Tom Bredlow reproduced a similar type of candle stick in the Washington National Cathedral to replace one of a pair and as a result ended up doing a large number of the gates and rails in the Cathedral. Figure 3 This candle stick starts as a rather large billet. I'd guess 1-1/2" square x 6" long. The forging may be done by hand (strikers) but preferably using a power hammer. 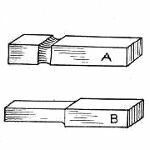 Figure 4 A 1" shank is forged on the billet and then the large end upset in a swage block or the anvil hardy hole. This requires some serious sledge hammering. 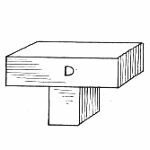 Figure 5 A riser block tool for the anvil is required. For the square cornered box the tool has square corners. It can be either the correct size to fit or smaller than needed. It also needs some extra height. Figure 6 The material for the base was upset then flattened until it was about 3/16" thick. It was then squared before turning down the edges. Figure 7 The corners are turned down and let bunch up. 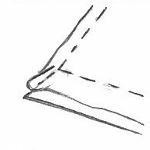 Do not crease the corners but leave them smooth and rounded like a fresh table cloth. 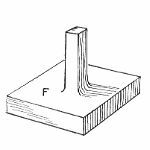 Figure 8 The corners are reheated and with rapid light blows using a small hammer the material is upset to make a clean corner. The finished corner will be thicker than needed. 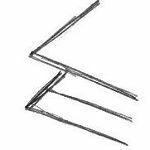 When the corners are all forged grind and file to a uniform thickness. Figure 11 The finished base then has the bottom edge cleaned up so that everything is square and plumb. 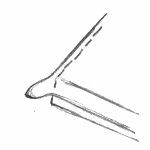 The stem, or shank, is then fullered, drawn and split as necessary. We are not covering the cups in this presentation as they are fairly obvious. 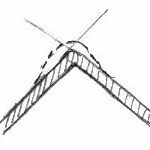 Figure 13 A tool similar to the one in figure 5 labled D except with sloping sides is used to make a base with sloping sides. 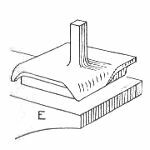 The base can start as the first above made from one piece OR be made from a seperate piece of plate. Figure 14 Again the corners will bunch up and need to be carefully upset to make a clean corner. 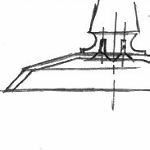 The finished Base is attached to the stem which has an upset end that fits the base creating a molded edge. 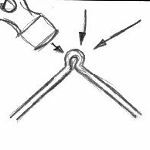 It can be attached by fire brazing or with screws from underneith as shown. These candelabrum are a style you would expect to see in brass or silver. However it was common to forge pieces of this nature at one time. Very nice job. I like the bases. Is the top all one pice or frabercated (outher than the cups)???? The top of both of these was not explained in the book. This was an excersize for making the bases. 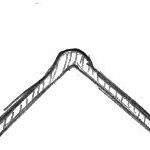 However they appear to be split and then the extra pieces forge welded to to the arms. 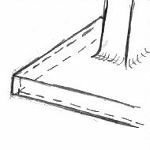 about how big is the riser block ( square)? 4" square. The base material was trimmed to 5-1/2" square. making the base about 3/4" to 7/8" tall. Jock, I like these candle holders. 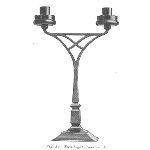 These, like the one you did last week, look like the "Nice" types of Candlebras that would be placed on a "Dining Table or Piano or on an Entry Hall Table". I like these, they are elegant and refined looking, I can see possibilities for some neat texturing effects to make them bolder, looking as well. Thanks. The Bases which you describe here is good, because it might be hard to recreate them w/out your explanations.